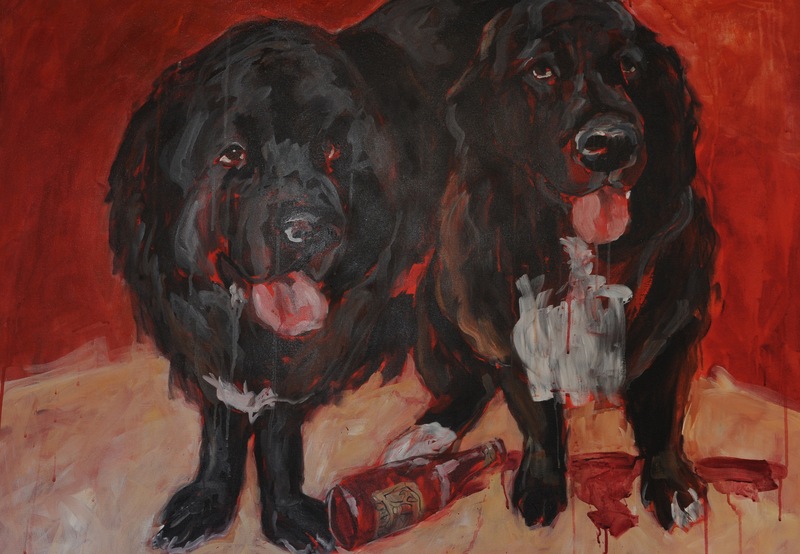 A couple of friends who had never been in the Malibu wine store, asked me about the dog picture at the top of the email, and it occurred to me that a lot of people might not know the story behind the painting that hung in Malibu Village Wines. The two Newfoundlands depicted are Odessa the sitting female, and my big knock-kneed boy, Amadeus. I had those dogs from 2000 until about 2008, sadly newfs are not usually long lived. Many people who saw my following dogs, Max, Morgan, Ollie, Peyton, and Mercedes, assumed that those were the dogs pictured. A dog lover, with faith in the artist’s ability would have quickly realized that the original two-some were black with a white chest patch, and the others were black and white all over (Called Landseer Newfoundlands, after the English painter of the 1800’s Sir Edwin Henry Landseer, who often painted the dog saving a life or portrayed the children of a wealthy family sprawled on a black and white Newf, and is most famous for his bronze lions at the base of Nelson’s column in Trafalgar Square), but many people were understandably confused. I had grown up with two Newfoundlands as a kid, and it’s hard to find a better breed with a family, or one that gets along in a small space, and with limited exercise needs. They just want to be around their owners, and the females in particular, want to oversee the house, family and any children. We purchased Amadeus as a 3 month old puppy, shipped to a little old lady in Las Vegas by a mid-west breeder. When the purchaser received her 40 pound puppy, with his giant puppy feet, she panicked, and knew she had to get rid of him before he grew even larger. The large breed rescue people were already trying to talk her into letting them place the dog with someone who had experience with newfs, but she wanted to recover her costs and was advertising the dog in the paper. We drove to her small condo to see the dog. It’s difficult to hold a fluffy newf puppy that looks like a little bear, without taking it home. Of course, we covered her costs, and brought the very large three month old home with us. A few months later, we received another call. There was a couple in Phoenix who wanted to find a home for their 6 month old female. I went to see the puppy, with Amadeus in tow, and they bonded. Apparently, they had acquired the dog two months earlier, and shortly after, had taken her with them driving across country to their winter home in Arizona. Halfway to Phoenix, the husband had a heart attack, so the drama, the hospitals and hotels halfway to Phoenix, and the puppy, were just too much. I am not sure if the puppy not being house-broken had caused the attack, or just contributed to the difficulties after. I discovered the lack of house-breaking as soon as we returned home, and an interesting couple of weeks followed. My new girl, who we named Odessa, was a 6 month old Newfoundland. Few things are more stubborn than a 6 month old female newf, and she had become very set in her ways. It was awfully hard to convince her that grass provided a better toilet than carpet, particularly when we had entered Malibu’s rainy season, and the inside of the house was so much cozier! We now had two growing newfoundlands, and one major issue. We had moved to Malibu and purchased a house, but were living in the guest house for two months before we could move into the main house. And, the guest house was down the hill, and down a steep flight of stairs, with very shallow treads, covered in Saltillo tile. As I had mentioned, it was a very rainy fall in Malibu, and those stairs were slippery in the rain. Our puppies refused to walk up or down those stairs, and I was forced to throw them over my shoulder and carry them up and down that slick stairway. Since the puppies were now over or close to 100 pounds and gangly, this was no easy task. And, as they both delighted in drinking copious quantities of water, the trips were frequent. By now, we had met our neighbors. The couple next door consisted of an artist married to a lobbyist. The couple across the street, Steve and Jen, owned an optical boutique at Cross Creek. As is common in Malibu, everyone loved wine, and Steve and Jen’s patio seemed to be the neighborhood spot to gather for consumption. Two things were determined on that patio. First, that our neighbor Cindy painted dogs, and we would love to have a portrait of Amadeus and Odessa. Second, Jen was “experienced” with dog training and could have our dogs down the stairs in minutes. As we had tried everything we could think of, several times daily for the past month, this was good news. After at least one bottle of wine had been consumed, Jen showed us her secret…dog treats that were proclaimed to be better than ours! As Jen proceeded to divulge the secret based on proper treat selection, she headed across the street to our stairs and I brought Amadeus up. With the dog at the top of the stairs, Jen set about her magic. I guess that magic had never come up against a stubborn, fearful Newf before. Amadeus planted both feet firmly, and wouldn’t budge. Not to be stumped by such recalcitrance, Jen held the meaty treat a foot in front of his nose and gave his leash a mighty yank. Off balance and unprepared, Amadeus flew forward, Jen flew back, and things were set in motion. Jen recovered a few steps down, and watched Amadeus slide past her, slipping down the stairs with his front legs straight ahead and his rear ones straight back, looking much like a polar bear rug as he crashed down the entire run of stairs and came to rest on the landing up against the wall. Amadeus never went near those stairs again, except over my shoulder. Equally motivated was Cindy the artist. She came up with a price that we gasped at, although it was considerably less than the many thousands of dollars a Malibu Gallery would ask for such a work. She took pictures of the two dogs interacting for nearly a month, but there was no mention of a timetable for the portrait project, and we despaired of it ever coming to happen. A few weeks later, several bottles of wine were consumed, before the neighborhood dispersed back to their own homes. Even though it was less than a hundred feet between all the houses, we were concerned that everyone walk home safely, as the wine tasting had gone well past the tasting stage. I was shocked when I pulled out of the silent neighborhood early the next morning to head into a meeting and saw a large canvas by my neighbors’ front door. I can spot a newf from a distance, and that painting was big. Somehow, Cindy had headed home, and while everyone else had crawled into bed, she had headed for the studio, pulled out her photographs and captured the essence of the dogs. The positioning relative to each other, their clumsy passage through our house, their expressions, Amadeus’ constant drool, and his knock-knees. The image depicted everything that made those dogs so special to us. And that portrait became the calling card for the little shop with the large dogs lying outside (and the price, on reflection, was a bargain).